Global Volunteers Keith Kresge and Tim Cunniff travel to serve worldwide. Together and individually, they’ve served on 37 service programs since 1998, and say they can’t imagine a better way to experience other cultures. 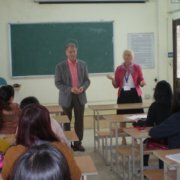 Keith teaching English at Hanoi University. Keith has volunteered on 22 service programs including three trips to India, two each to St. Lucia, Mexico, Vietnam and Italy, as well as trips to Montana, Portugal, Ecuador, Peru, Hungary, Poland, Spain, and China. Keith joined Global Volunteers’ Board of Directors in 2015. His husband Tim has likewise served 15 times – in India, St. Lucia, Mexico, Portugal Vietnam, Ecuador, Peru, Hungary, Poland, Spain, Italy and China. Their favorite programs? Always the last ones they served on! We’re grateful that humility, generosity and kindness have led Tim and Keith to travel to serve for nearly 20 years! “ I chose these work projects because it’s so far removed from my day-to-day life experiences. As an adoptee at age two, it is also personally important for me to help support the community projects. I wholeheartedly agree with Global Volunteers’ mission to provide essential services to children. 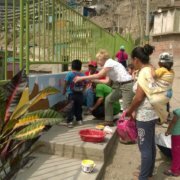 Keith assisting a toddler in Peru. If you’ve never been in the position to work with toddlers and pre-school children, you’ll discover it’s challenging, but also a fun and meaningful opportunity. You see the world through the eyes of a child as you play and teach. The novelty of being the adult male in the room supports the curiosity of children. I don’t have children, but I’ve always thought it’s very important for children to experience a male presence in a supportive, educational, and caring environment. Not to say that they aren’t getting that support in their home life, but in an institutional setting, women are generally the authority figures, and men are absent. “Honestly, starting this volunteer journey in 1998 by teaching with Keith in Puglia, Italy sounded like the easiest way to get involved with Global Volunteers. The only requirement was to be a native English speaker willing to speak with the students to encourage their language education. Tim in a St. Lucia preschool classroom. We worked with students in grade school as well as working adults – allowing for a broader understanding of the whole host community. It was great to draw on our personal experiences to share understanding of language. I enjoyed the problem-solving challenges when you work to find the best way to communicate at various levels of proficiency. It has been our experience that even the least proficient students are eager to learn about our lives in the United States, and sometimes will encourage their stronger classmates to ask questions for them. The students understand you’re there to help them. so they get a sense of importance and value that makes the relationship special”. “Travel to Serve” is Keith and Tim’s motto. Generously contributing their vacation time, they’ve helped improve the quality of lives in partner communities around the world – and keep on coming back! Hear Keith’s story in his own words in Episode Two on the Be The Change podcast. Faithful Global Volunteer Serves 16 Times in Romania Family of Four Serve and Explore Greece!